Tues. to Sun., 11 a.m. to 2 p.m., 5:30 p.m. to 10 p.m. It applies to restaurants all over the world, frankly. Especially in another cultural melting pot like the Philippines. So it’s quite refreshing to find a restaurant that doesn’t claim to be authentic, but rather, highlights its progressive nature. Like new fusion Japanese restaurant Fukujin Izakaya. 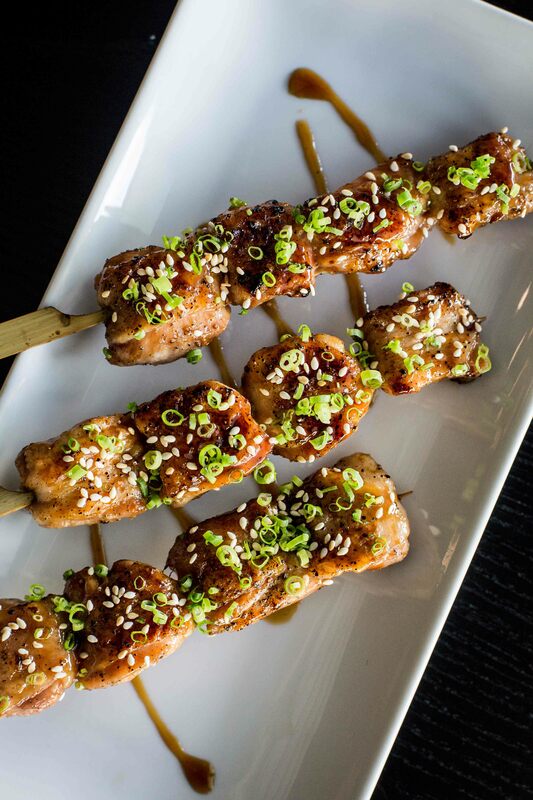 Classic kushikatsu befitting the izakaya vibe: yakitori or grilled chicken skewers. Fukujin, named after the seven gods of luck and fortune, uses Japanese dishes as a base, and builds on the dish with Western and European techniques and ingredients. 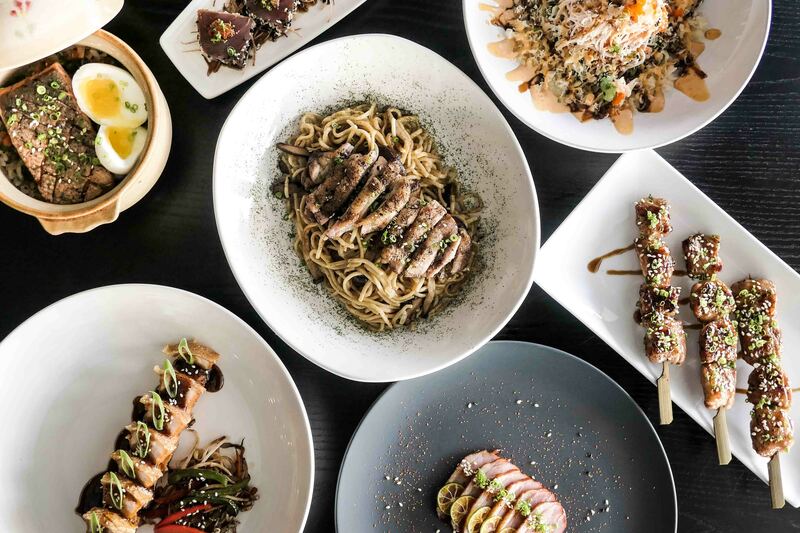 The result is a menu that strikes a balance in flavor and texture, making each bite an experience in itself. Take their tuna tataki, for example. Unlike the usual tataki that uses pan-seared tuna, Fukujin’s rendition adds an element of crunch by marinating the tuna in sesame. 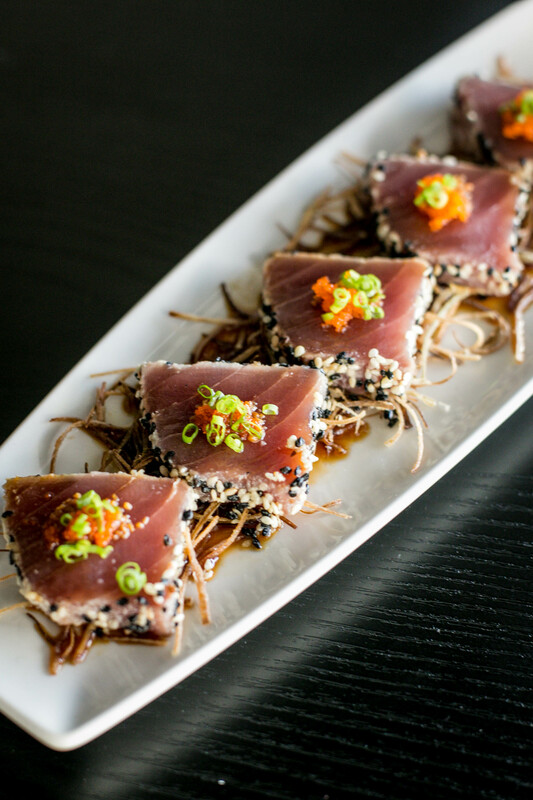 The sesame-crusted tuna tataki has ponzu sauce, and is served with garlic chips, fried leeks, and tobiko (fish eggs). Meanwhile, the refreshing kani salad gets a hotter update. The salad, made of kani sticks on marinated seaweeds, topped with crunchy fried tempura batter, sesame seeds, spring onions, and tobiko, is slathered with spicy mayonnaise and unagi (eel) sauce. To make the mayo spicy, Fukujin uses a mix of shichimi togarashi and sriracha. For heartier fare, go for their take on nabe. Traditionally, nabe is cooked at the table and features a variety of ingredients ranging from vegetables to meat. It also often comes paired with noodles. Fukujin’s version is served with rice, and instead of being mostly soup or stew, it appears more like kamameshi rice (rice cooked in an iron pot), but served in the usual clay nabe pot. The rice is cooked with broth instead of plain water, and the broth depends on the meat that will accompany the rice. 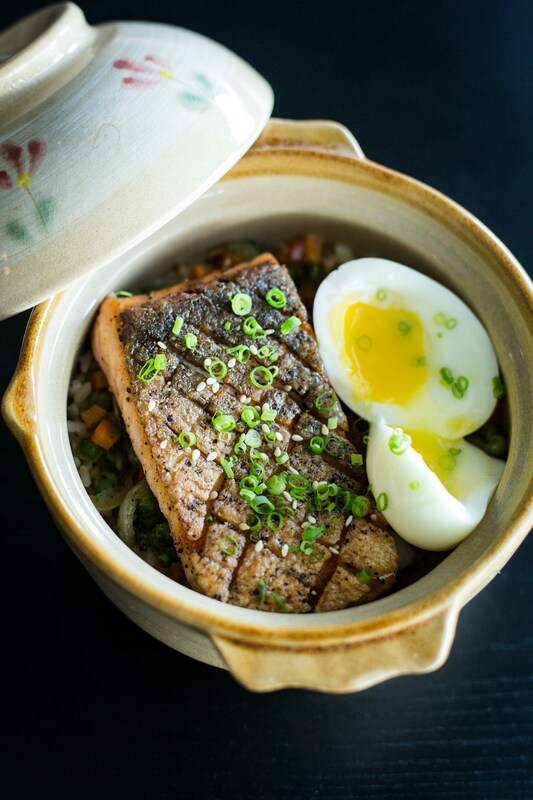 Guests can choose from chicken, which will be cooked with a kimchi-based broth, beef with shoyu broth, and salmon with tonkotsu broth. Salmon nabe. Inspired by the Japanese nabe, this version uses rice cooked in broth, topped with meat and vegetables. The salmon nabe uses tonkotsu broth to cook the rice. Tuna tataki, seared tuna with a sesame crust, served in ponzu sauce, garlic, fried leeks, and tobiko. 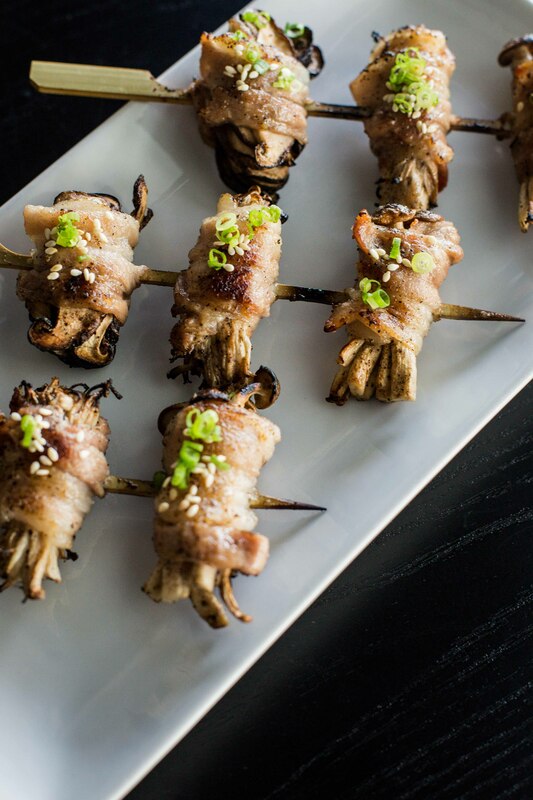 The smoked duck is comes in thin slices topped with calamansi, spring onions, and togarashi. It’s meant to be eaten in one bite. The star of the menu is an Asian take on the classic French dish duck a l’orange. 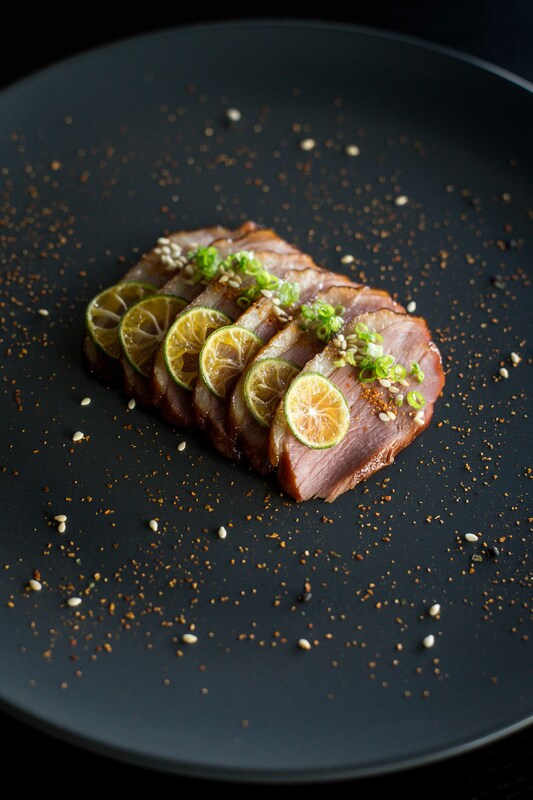 The duck is sliced into thin, bite-sized cuts, and is served with calamansi slices, sprinkled with shichimi togarashi and sesame. 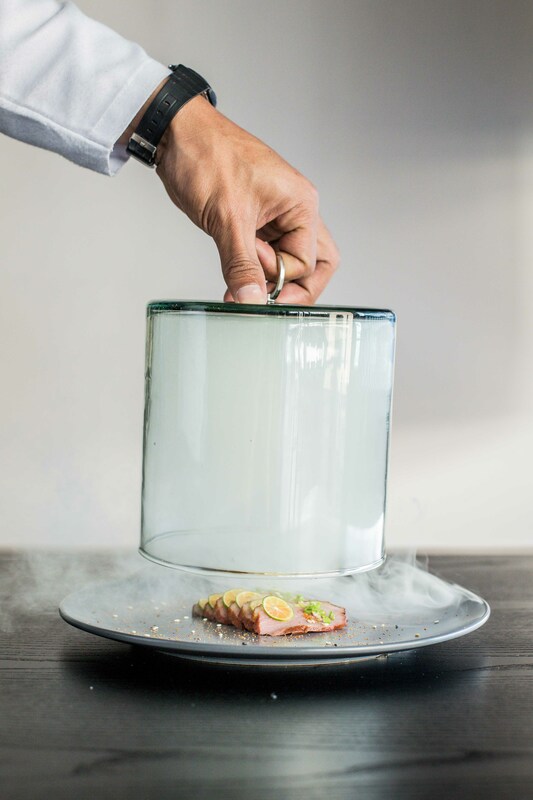 The dish comes enclosed in a glass dome filled with smoke, giving the duck a smokey flavor. A tip to get the most of the dish’s flavors: Eat a duck slice in one bite with the spices and calamansi together. 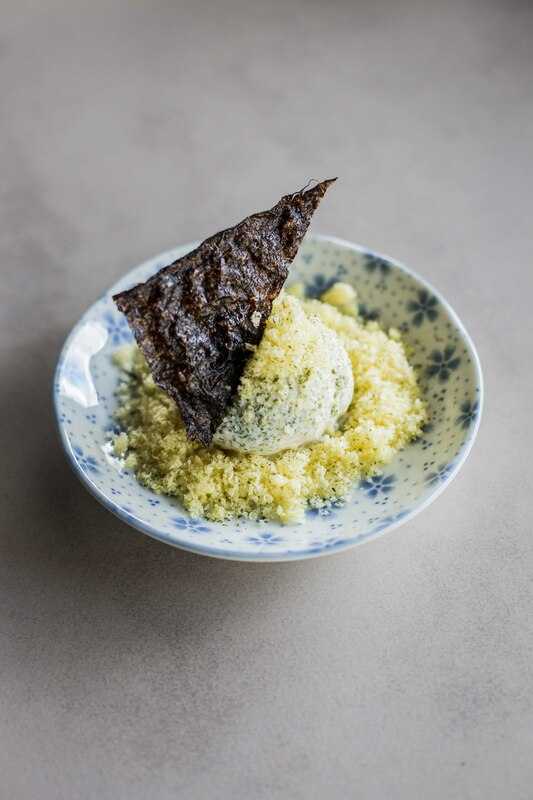 To cleanse the palate, order their nori ice cream—a unique, homemade treat that has the mild saltiness of nori mixed into the cream. It comes topped with crushed sweet corn puff, adding texture to break the dessert’s creaminess. For dessert: Nori ice cream with crushed sweet corn puffs. Sounds like a weird combination, but it’s actually a palate-cleansing treat. Try their Asian take on duck a l'orange—smoked duck served with shichimi togarashi and calamansi. For a different dessert to cool down with this summer, try their nori ice cream.